I'm loving the album. I have always been a big fan of the work Steve did with the early SSJ albums, and these versions sound true and fresh. 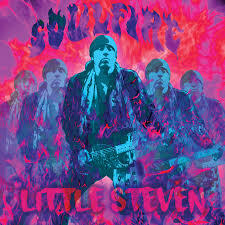 Completely agree with your comments about this album and about Little Steven in general. He's been a top bloke from the very start and throughout his professional life, always remaining true to himself, never compromising his beliefs and, most importantly, never once believing his own publicity. At the risk of sounding like a dreadful name dropper, I met him once, in a restaurant in Milan and I chatted to him for about ten minutes and, although he'd just finished a gig and talking to me was probably the last thing he wanted to do, he was absolutely charming. They say "never meet your heroes" but that doesn't apply to him. Great comment John. I know only too well the never meet your heroes bit, but there are wonderful exceptions.